i Click 'view all' to instantly compare this ok deal with offers on other top beer bottle openers. ORBLUE Wall-Mounted Bartender's Bottle Opener Set of 2 is currently selling at $6.29, which is its normal price. It has a lowest price of $6.29 and is selling within its usual range. Price volatility is 0.15% (meaning it does not change often), so you might have to wait a while for the price to drop. Until then this is a recommended 'ok deal'. There is a coupon available for an additional 10% off. The current deal is also the best price on this item over the last month. 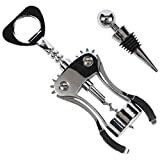 Compare the current price, savings (in dollars & percent) and Buy Ratings for the top Beer Bottle Openers that are closely related to ORBLUE Wall-Mounted Bartender's Bottle Opener Set of 2. Here is how ORBLUE Wall-Mounted Bartender's Bottle Opener Set of 2 compares with other leading Beer Bottle Openers. 1. It easily mounts to any vertical surface with the included 4 matching screws and sleeves. 2. Heavy-duty cap remover is designed to let you pop beer and soda caps off with the quick twist of one hand. 3. Makes a great gift for home brew connoisseurs.4. Sold in a pack of 2. 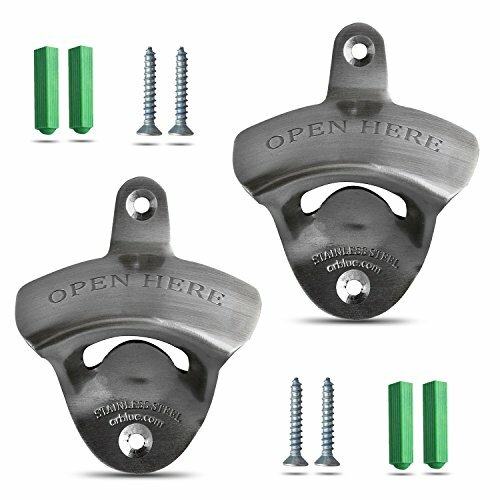 FeaturesRemove beer & soda caps with a quick flick of one hand using this high-quality bar accessoryMounts easily to any vertical surface in your bar, backyard or kitchen with 4 screws & sleevesMade from stainless steel so it will never rust & always preserves its elegant appearanceComes in set of 2 - Install one in the kitchen for soda & another at your home bar counter for beer!